The State Department is gaining support from other nations for its framework for international cyber stability, which outlines responsible conduct in cyberspace. The framework includes global affirmation of the applicability of international law on cyberspace, development of international consensus of norms of state behavior in cyberspace that apply during peacetime, and development of practical, confidence-building, and transparency measures that can aid states and prevent inadvertent misunderstanding and escalation. “We’ve been forging a growing international consensus on this,” said Christopher Painter, coordinator for cyber Issues at the U.S. State Department. The framework specifically tells states not to attack other nations’ critical infrastructures during peacetime and encourages states to work together to combat common cyber threats. The State Department chose to work on this framework because of the increase in prevalence of cyber issues. Cybersecurity affects national security, economic policy, social issues, human rights, and foreign policy, which is why it has grown to be a well-known problem, according to Painter. 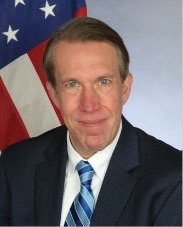 Painter’s office at the State Department, which is writing the cyber framework, was the first of its kind when it was created five years ago. There are now 25 cyber diplomacy offices worldwide, according to Painter. “That’s a response to the shifting landscape and that these issues have grown,” Painter said. Hackers have different motivations and often avoid prosecution by operating in various locations, which is why an international agreement is imperative, according to Painter. The Internet of Things also poses a cyber threat that Painter witnessed when a group of connected refrigerators instigated a denial-of-service attack on numerous business websites in the United States. Painter emphasized the importance of promoting an interoperable, open, and resilient cyberspace.